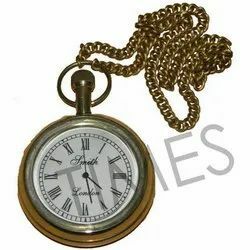 Brass Gandhi Watch offered come in bright and shiny brass finish and is a perfect representation of the original watch used. Coming with beautiful chain support, smooth shiny glass dial and other finishes this watch provides support as a functional piece as well as is also suitable to be used for decorating the interior spaces. Beautiful Polish Finish Marine & Maritime Nautical Corporate Gift. All Types Of 'WATCHES' Available In Brass & Wood. This Gandhi watch has an antique look that is amazing. It is made of pure brass metal with gold polish and chain to make it stylish. It has roman digits and cream color unique round dial to enhance its beauty. It is an exclusive watch for your keeping in the pocket which assures to get admired by your friends. Shop this Artistic item at the best price. Golden engineering Corporation offers Brass Sundial Watch 5 inch in a beautiful Brass inlaid in wooden box. Medium size sundial for telling time using the sun. Great for field use and telling time out camping. You will love this item once you hold it. This sundial watch has a classic outlook. 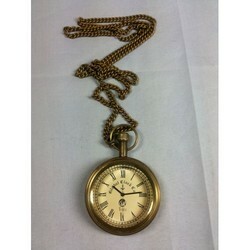 With the aid of our experienced team, we are devoted towards providing an exquisite range of Antique Gitar Brass Watch. - Brass Accessories for automobile . - Durable design with long lasting Golden finish. Antique Brass Watch. Table top/wall clock in antique look. Made of quality raw material. Available in competive pricing. Suitable for decorative/gifting purpose.